The former Crosby High School in Belfast. 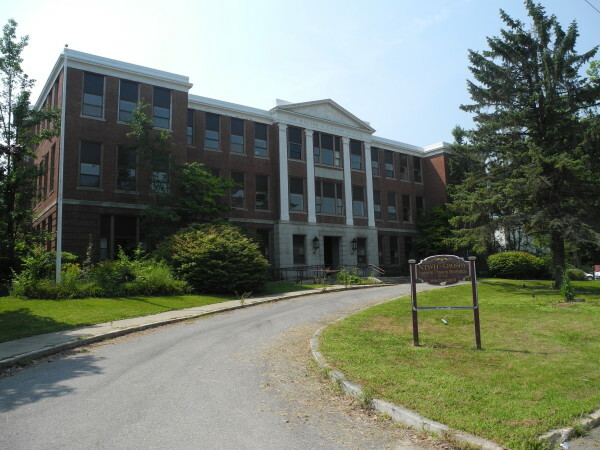 BELFAST, Maine — A crowd of about 50 people was surprised Wednesday morning when the scheduled auction of the former Crosby High School building was called off without warning. Shortly after the advertised 11 a.m. start time, Mike Carey, the auctioneer from Portland-based Tranzon Auction, told those assembled that the event was off. “As of now, I’m not going to stand up here and sell the property,” Carey said. Jill Daviero, a vice president from the auction house, said that while the company has heard from some interested parties, none of them showed up Wednesday with the $25,000 deposit required to bid on the school. The minimum price for the Crosby School had been set at $400,000. “For whatever reason, they didn’t show up today,” she said, indicating she thought that the building was still likely to sell sometime in the near future. The owner of the three-story school, an imposing brick building located in the heart of Belfast, is the National Theatre Workshop for the Handicapped. Before placing it for auction, the owner had an option to sell the building to Waterville developer Paul Boghossian, who indicated he would renovate it into market-rate apartments. He dropped the option to purchase the building in October, shortly after receiving a discouraging environmental assessment. The school had problems with mold as far back as 1991, when School Administrative District 34 closed it as a junior high school in part because of health complaints by teachers and students. A few years after it was closed, the city sold the 1923-built structure to the New York City-based theater organization for $200,000. The nonprofit theater group reportedly spent $3.5 million to add theaters, lounges, apartments and elevators to the building, which is assessed by Belfast at $2.7 million. The school, which was featured in the 1957 movie “Peyton Place,” is under contract rezoning, meaning there are a greater number of allowed uses for the property. Mayor Walter Ash, who was on hand for the auction and attended the school as a boy, said he was baffled by the lack of bidders.